One of the best things about working in Camden Market is the eclectic mix of people you meet and the extraordinary stories they have to share. Such a chance encounter led the owner of Camden Piano Rescue, Desmond Gentle on an adventure of a lifetime. Nestled on the West Yard staircase leading up to Market Hall, Camden Piano Rescue is the perfect place to go if you happen to need a piano tuning or repairing. In the 19th century, piano manufacture was Camden Town’s main industry. At this time, almost every street corner in North London was a piano works. 200 years later and Desmond's workshop is a testament to this history. Challenge accepted. What started off as nothing more than a passing comment, set in motion a chain of events that a year later saw 65-year-old Desmond and his team of 20 people climb the Himalayas with a piano on their backs, so to speak. 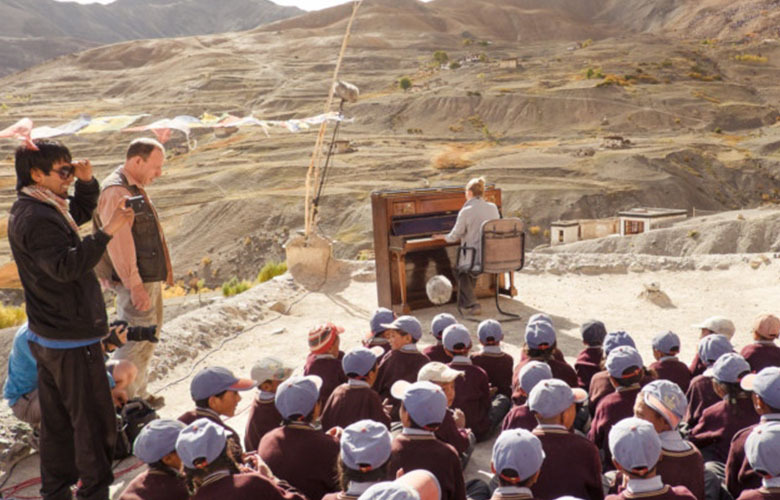 The journey began with a flight to Delhi, followed by a long drive to Leh in Kashmir and two days of trekking, carrying the piano by foot across the mountains. After one final hike which involved walking on 15-inch-wide trails over 1,000 foot drops, the group finally reached their destination. Naturally the arrival of the piano caused excitement in the local community, especially amongst the children who, largely unfamiliar with Western culture, had never seen or heard a piano before. ‘We played them some Chopin and a few modern pop songs – the children were so excited. When the snow comes they spend months stuck indoors so it’ll give them something great to do.’ The children are to receive lessons by a visiting concert pianist and Desmond and his group are planning a second trip to Lingshed to hear the children playing… and to tune the piano, of course.